I graduated from Erickson Collegiate in 2012 and am currently finishing off my undergraduate degree, B. Sc, with a major in Physics and a minor in Mathematics. I will graduate spring 2020, and I plan to continue schooling. I was on the honour roll in high school and received a monetary award in recognition of my performance. During my undergraduate studies, I have been the recipient three times of the MTS (MB Telecom Services Inc.) Scholarships for Aboriginal Students 2016, 2017, 2018 for which I am thankful. I am a Let’s Talk Science volunteer, and providing youth with more science related opportunities is something I strongly promote. As a teen I volunteered through Brighter Futures, a program directed towards aboriginal youth in Rolling River reserve. (2012-2013). I’ve also volunteered for West Region Child and Family Services Inc. assisting in coordinating youth summer day camps (2008, 2017). I was the coordinator for Fun Math Games (2016-17 school-year) which encouraged people to try a fun side of math. I am for sure most proud of my daughter, as she is my greatest accomplishment. (Cheesy but true). I would like to be a role model for people, and my daughter, to continue with education. I am an Anishinaabe from Treaty No. 2 Territory, here in Manitoba. My ancestral roots are from the Ojibway-Cree cultural groups. Sadly, with the death of my great grandfather in the 1980’s, the cultural knowledge and spiritual practices of my family history was lost. My great grandmother had migrated from her reservation to her husband’s, Rolling River First Nation, in the late 1950’s. Both my great grandparents were affected by the residential school system, with my great grandmother directly spending her childhood in a school here in Manitoba. What we are now understanding with the residential schools, is that family functioning became extremely deteriorated in many Indigenous families. My family was no exception. My mother was a permanent ward of the Child and Family Services agencies all her life. She had spent the first 15 years of her life on the reservation and at the young age of 15, she became pregnant with me. Determined to provide a better future for her unborn child, she left the reservation and established us in the city of Winnipeg. I grew up with my mom and sister in South St. Vital. I attended Darwin Elementary, I had a great school experience there. We later moved to the north side of the city, but I continued schooling on the southside at Nelson McIntyre Collegiate. My mother converted to Islam when I was five and I spent my middle-school years at a private Islamic School. I had a great teacher, Brother Walid, there who had good ethics and morals and believed in the betterment of humankind. I would also like to thank my Pre-Calc40S instructor Mrs. Frey for believing in me. After graduating high-school I decided to move to Brandon to raise my daughter close to family. We have now been here five years and I know this little town feels like home to her. I spend my time parenting and solving math problems because that is what I love to do. My mother has been my role model; she overcame a lot of social and financial barriers to raise her children and graduate with a BSW with honours at the University of Manitoba. As such, furthering my education was always a known determinant growing up. Ever since my first Physics class in high-school, it has always been my choice of study. I was amazed that Mathematics could describe the laws of the physical world and that has always stuck with me. I am also very excited to see what interests my daughter and cannot wait to support her with whatever field she wants to go into. I have always had great teachers who have encouraged me, and believe educators are very important. I would also like to thank Sarah Plosker, Dr. Foster, and Mrs. Nichols who have helped me succeed here at Brandon University. I plan to pursue a master’s degree, perhaps in Engineering, at the University of Manitoba. That God will never give you more than you can handle. That we all have the strength to overcome whatever challenges are put into our lives no matter how difficult they may seem. That while everyone is unique, we are all essentially humankind and being respectful of others is how everyone deserves to be treated. And to have a positive outlook on life! That, is extremely important. We would like to nominate Ms. Farrah Huntinghawk for a Women of Distinction Award. Farrah was born in Rolling River First Nation and grew up in Winnipeg. 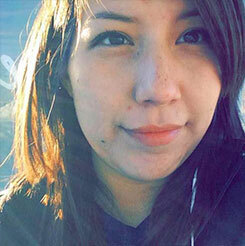 She started high school in Winnipeg and then graduated from Erickson Collegiate. Farrah is currently pursuing a 4yr B.Sc. in physics with a minor in mathematics at Brandon University. The basis of her success in her studies is that she is a very hardworking and motivated student with a real desire to learn. In addition to her course work, in 2016-17 she held a Brandon University Students’ Union (BUSU) Work Study grant, supervised by Dr. Plosker. Through the tenure of this grant, Farrah organized and hosted 10 Fun Math Events at the Indigenous Peoples’ Centre spaced over the academic year, honing her presentation skills and leadership skills. Students particularly enjoyed the fun competition of the Sudoku tournaments, as well as the hands-on learning through various logic puzzles. Farrah shows promise of being a role model and future mentor to young Indigenous students in Science, Technology, Engineering and Math (STEM). She plans to pursue graduate studies after finishing her undergraduate degree at BU. Farrah is an extremely mature, highly motivated student. In addition to all of her accomplishments and commitment to her studies, she is also a single mother of a five year old daughter. We believe that Farrah is very deserving of recognition for her achievements.